It’s been 13 years since I last went to Istanbul. On that trip, I made a promise to myself that I’d be back one day. Istanbul really captured my heart on my first visit and so I was slightly nervous that it might not live up to my memories the second time around. I’m glad to say that my worries were totally unfounded – I’ve fallen in love all over again! Early in the summer, my friend told me that she was getting married and that the ceremony was happening in Istanbul – this was a no brainer for me! What better than to celebrate someone’s love in this beautiful City that straddles both Europe and Asia. Naturally, there was some apprehension given the recent political instability and security concerns. But the prospect of attending my friend’s wedding as well as seeing Istanbul once more gave way and I booked my flights and started planning. Istanbul has a fascinating mix of eastern and western culture. It is jam-packed with history around every corner and, in my opinion, the architecture is jaw-dropping. The sound of the call to prayer from the many mosques, the beautiful skyline along the Bosphorus, the sunsets, the chaotic bazaars and of course the riverside fishermen all add to the cultural explosion that this City offers. If Istanbul has been on your list for some time now, throw caution to the wind (with reason of course!) and take the leap. It’s a stunning City that you won’t regret experiencing. On this trip, my friends and I stayed in the Sultanahmet area which was walking distance to all the main sights. It’s the older and more historic part of town with smaller, boutique hotels rather than the larger chains that you’ll find in the Taksim area. The tram system is really efficient and great to hop-on after a long day of sight-seeing (individual journeys cost around 60p and they have a card similar to the oyster called ‘Istanbulkart’ that can be topped up). 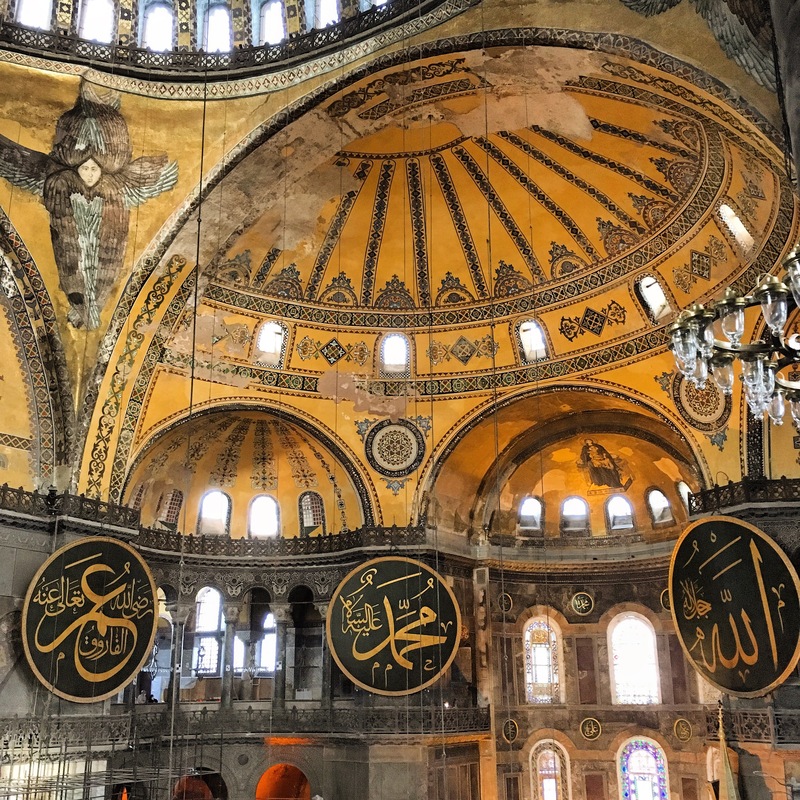 On our first day, we decided to head to the Hagia Sophia – it is one of the most interesting buildings in Istanbul as it used to be a Church which was later converted to a mosque. I particularly love that aspects of both religions sit together side by side. We then headed to the Sultanahmet ‘blue’ mosque which is a stones throw away from the Hagia Sophia. This is probably the most popular mosque in Istanbul, for tourists at least. Remember to bring a scarf with you and avoid wearing shorts/short skirts. The next day we headed to Topkapi palace which used to be one of the major residences of the Ottomon Sultans for nearly 400 years. It is a classic, traditional styled palace with stunning tile work and cool, breezy rooms and verandas. The gardens surrounding the palace are so peaceful – I could’ve spent the whole day sitting there! Can I sit here all day? After Topkapi palace, we headed to the Grand Bazaar for some retail therapy! I have to admit, I was a bit disappointed with the bazaar. Having been to souks in Marrakech, I was expecting amazing leather goods and traditional jewellery but instead found a lot of knock-off handbags and other over priced goods. I would suggest going to smaller, less touristy markets for shopping. You’ll find the real bargains away from the Grand Bazaar! If you do find something you like here, be sure to bargain and don’t accept the first price quoted. After the Grand Bazaar, my friends and I rushed back to our hotel to get changed for the wedding! I have to say, this wedding is definitely on the top of my list for experience and ambience! It first started in a beautiful Greek Orthodox Church after which guests were taken on a boat ride, down the bosphorus, to the Asian side of Istanbul for the main reception. You have to take a boat ride if you’re in Istanbul, especially if you can do this at sunset. The skyline is breathtaking and the views are unreal! Just the most amazing day, topped off with the most beautiful wedding – thanks C! I hope you enjoyed this post – stay tuned for part 2 with more on Istanbul’s best sights!